Three adorable Coffee themed designs! "Today's good mood is sponsered by Coffee! ", "Dear Coffee I love you that is all", "But First Coffee". 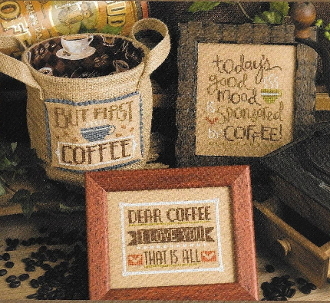 Design sizes: Today's Good Mood 4" x 4.75", Dear Coffee 4.75" x 3.75" Models stitched 2 over 2 on 32 count Amber/Toasted Almond Linen (sold separately, see item 31-119), But First Coffee 4.25" x 3" Model stitched 2 over 2 on 28 count Amber/Toasted Almond Linen (sold separately, see item 31-134). Instructions given using Weeks Dye Works threads with conversions given for DMC embroidery threads (not included).